We are extremely proud of our achievements and awards in the logistics solutions industry! At Custom Goods, we have instilled a company culture that calls on all CG team members to self-examine their task and question can it be done better, more efficient, more cost effective. Our culture embraces Kaizen which means “continuous improvement”. Always pushing to new limits, exceeding customer expectations. 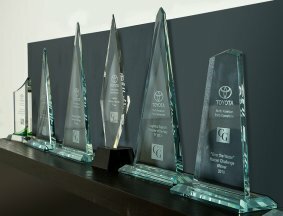 During the past year, our Toyota programs and projects have allowed us to excel in our abilities, and Toyota recognized our efforts. 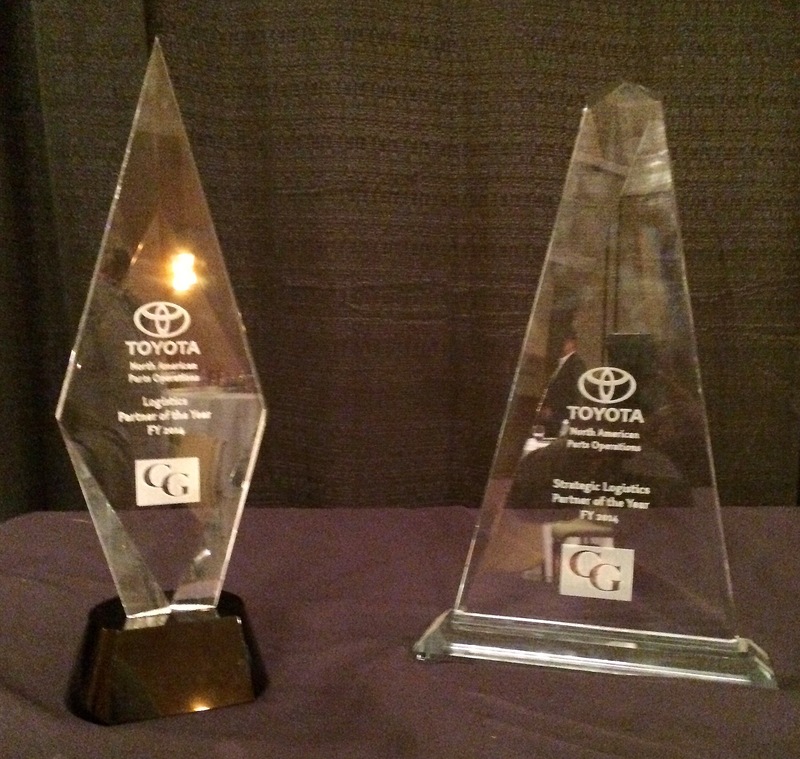 Custom Goods was awarded two (2) of Toyota’s highest awards…2014 NAPO Strategic Logistics Partner of the Year and the 2014 NAPO Logistics Partner of the Year. “Within Toyota’s supply chain, we have the modes and lanes that are part and parcel of every Shipper’s network—Ocean operations, dray, Truckload/Intermodal, LTL, Dedicated Delivery, Air, Small Parcel. Most of the time a Partner fills a specific need and provides services within that sphere of operation. But in the kinetic and frequently frenetic world that we operate in, it’s important to have a Partner who can step in and operate everywhere we operate. Our Logistics Support Partner of the Year does exactly that. This partner maintains core operations right next to both our Parts Centers. This gives them the flexibility to operate step in step with NAPO, and serve a variety of roles, whether that is overpacking and consolidating shipments to our Distributors, transloading Service Campaign parts, or making yard space available to us on an ad hoc basis. Our Support Partner of the year is willing to step in anywhere they are needed, at a moment’s notice. They do this proactively and with an eye towards excellent service. NAPO can pick the phone any time of the day and request the unique, the untried, and this partner will make it happen. “Choosing NAPO’s Logistics Partner of the Year is really tough. Each of the winners in their mode has proven that they excel in what they do. To win the Logistics Partner of the Year, a carrier must do it all, and more! And this year’s winner does, indeed, do it all. These are the guys who say Yes first, and ask questions later. Their operations pop up wherever we need them. They are adaptable and available 24 hours a day. They not only put Custom in Customer service, they also have it as part of their name. 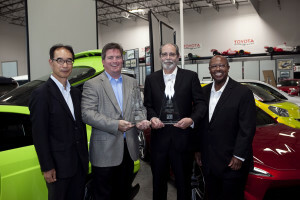 Custom Goods has been awarded the Kaizen Challenge Award from the Toyota North American Parts Organization (NAPO) for continuous improvement for the third consecutive year (our fourth award in the past five years). 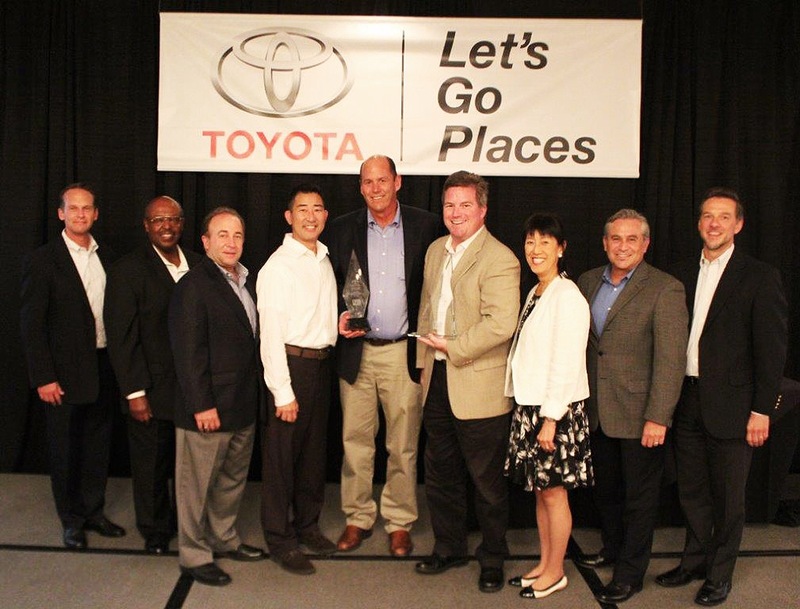 Toyota NAPO announced the 2012 award winners during its annual Logistics Partners Meeting, June 26, 2013. Kaizen, Japanese for continuous improvement, is a vital component of the Toyota Production System (TPS). To encourage its suppliers to embrace this philosophy, Toyota created the Kaizen Challenge Award and all preferred suppliers (approximately 30) are asked to participate to in the challenge. The Kaizen Challenge Award recipients are the suppliers that most effectively used Kaizen principles in working with Toyota to enhance its Logistics operations. or provide niche logistics and handling support. Whatever the case or our need, these partners provide the glue that makes it all stick together and allow us to focus our efforts and resources on our customers. 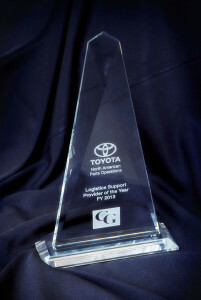 This year the award is being presented to a support provider that consistently demonstrates that they “Have Our Back”.Whether partnering with another carrier in the creation of a specialized handling and delivery service to support Heijunka, improved delivery and customer satisfaction for our distributor…. These guys thrive on the challenge, partner every step of the way with our business units and facilities, and integrate their capabilities with our supporting carrier base. They can Do it, and they Do It Right. Congratulations to Customs Goods for winning the 2012 Logistics Support Carrier of the Year award.